The unfortunate news announced by Ford of Australia in April 2011 (“Ford to cut 240 jobs as sales of larger vehicles slump“) of a 20% cut in production due to slumping sales and a layoff of 240 assembly line workers means an uncertain future for the Ford Falcon product family – and also has ramifications for the future of the Ford Mustang in the North American market. Add to this the J Mays statement at the 2011 NAIAS hinting that the Falcon cannot continue on an “orphan” platform: meaning a platform local to Australia only and not used elsewhere in the world per the Ford “One World” methodology. The platform is currently used for the full size 4-door Falcon sedan and chassis-mates including the Falcon Ute (which is very popular in Australia) and crossover SUV Ford Territory. Despite One World, the bottom line is that sales have been consistently dropping over the past few years as the platform ages and becomes less competitive. This makes any continued financial investment by Ford difficult to justify. And while the Falcon family is just barely profitable, it isn’t profitable enough to pay for a much-needed all-new platform. Compare and contrast this to Holden (General Motors of Australia), which debuted an all-new platform in 2006 for it’s full-size Commodore family of cars. These were designed not only for Australia, but are also exported to several other geographies around the world and recently (in long wheelbase form) came to North America as the Chevrolet Caprice police car. And as of model year 2013, will also come back to the United States with a Chevrolet badge affixed to what we previously knew as the Pontiac G8. The same platform is also used for the current North-American built Chevrolet Camaro. As the Holden products and Camaro are replaced by the all-new and even more advanced “Alpha” platform starting in the 2015-2016 timeframe, exports will continue. The Alpha platform is already being used for the new Cadillac ATS and will provide the basis for the next CTS as well. GM has been very smart here and is well-positioned for the future – although clearly they failed with the Pontiac G8 variant sold for a short time in North America. The G8 only failed because GM itself was failing… not because it wasn’t a desirable and well-built product. A world-class chassis for the Mustang and Falcon (and perhaps for a future RWD Lincoln sedan and crossover SUV). If done optimally this could be a Ford Motor Company equivalent of Nissan’s highly successful FM platform (used by the 370Z as well as several Infiniti products). *Very* expensive, and commits Ford to using the platform beneath several variants. Technically, this would be fully competitive with GM’s Alpha platform and could be used worldwide in the same ways. But is Ford confident enough in itself to take the leap? A “modernizing update” to the current S197 chassis, with the much-needed IRS and more high-strength steel to reduce weight, shared with the Falcon. This would be less expensive, less technologically adept, and more of a compromise since it fixes the size of both cars to roughly the current S197 width: too big for a modern sports coupe, and too narrow for a Falcon sedan. This is the cheap (and shorter-term) way out of the problem and will generate immediate goodwill benefits with Ford fans in Australia and North America. A variant of the next Taurus platform for Australia (stretched Mondeo/Fusion, probably 4 years away). 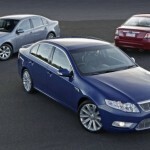 An important factor here, although complicating, is the very clear preference in Australia for a rear wheel drive Falcon. This is both emotional (given the long term history of the Falcon in the country) and economic since a locally-produced Falcon provides much-needed employment and tax revenue (assuming the products are financially successful). And that also makes it a political decision. The Australian Government has provided incentives to help keep the current Falcon in production, as well as it’s locally-produced 4 liter inline six engine (another “orphan” and a legacy engine dating back to the early sixties in it’s original form). Ford provided a small cash investment recently with some styling updates and the addition of the existing 2-liter EcoBoost 4 cylinder engine to raise mileage and reduce emissions. Our preference is for the first outcome and variant A: a worldwide Ford “FM’-like platform. Take the lesson from Nissan: lightweight, aluminum-intensive, capable of housing a range of engines from 4 to 8 cylinders, hybrid-capable, and designed to underpin a family of worldwide products. In our opinion, Ford engineers should be given the opportunity to demonstrate what they are truly capable of (need we say Lincoln LS, this time understanding the efficiencies and leveraging the benefits far better) – versus what they are (all too often) constrained to do. Ford is extraordinarily healthy now, sales are reaching all-time highs, and the technology exists to make rear wheel drive cars very competitive in terms of fuel economy. A more modern Falcon, lighter, and with a world-class EcoBoost engine (we already know the 2015 Mustang will use a 2.3 liter EcoBoost engine for it’s base engine), can be exported to China and the Middle East as well as built locally alongside the Mustang for North America and Europe. Size it right and it will also provide a premium product for Europe as well the types of products that Lincoln needs to reach it’s own potential. And speaking of “goodwill“, in 2013 we’ll see the arrival of Australia’s own V-8 Supercars racing series in the United States at the new Circuit of the Americas Formula 1 track now being built outside of Austin, Texas. The V-8 Supercars series is a hard-fought battle between Ford of Australia and Holden featuring legions of battling Commodores and Falcons. It has a long history in Australia and is very near and dear to the hearts of enthusiasts and to the minds of buyers in Australia. If GM is smart, they’ll temporarily re-label the Commodores as Chevy Caprices for this one event (and there will likely be Chevy Caprice police cars in America by the tens-of-thousands by then… and possibly a civilian version as well). But Ford will have nothing to offer… no marketing benefits in North America whatsoever from the very appealing and fan-favorite Falcons. Wouldn’t it be something if Ford were to show a Falcon concept in the United States in 2013, parade it around the track at the event, and then go into production in the summer of 2014? Alas, it’s too much to hope for… and it would be insulting and enraging to North American fans if the Falcon wasn’t sold here in some form or another.